If you are traveling to Africa on a budget and your focus on safari is wildlife, a budget camping safari may be perfect for you. You’ll need to set up your own tent and help with camp chores but you’ll still experience the remote bush. Pros: These trips are a great value for the money. Some of our guests book a budget safari then spend extra for a few nights in a lodge. Groups are small and your fellow travelers will more than likely share your adventurous spirit. Most campsites are in the remote bush and there’s always the chance wildlife will wander through camp. Cons: This is basic camping with dome tents, sleeping on the ground (pads, no cots). You’ll have “bush ablutions”: shared long drop toilets and showers. Any extra activities (mokoro or boat trips) may require an extra cost. Though not required, some of our guests will assist with cooking and setting up camp. Beverages (water, beer, wine, etc) are not included. As these are schedule departures we can’t amend or change the itinerary. 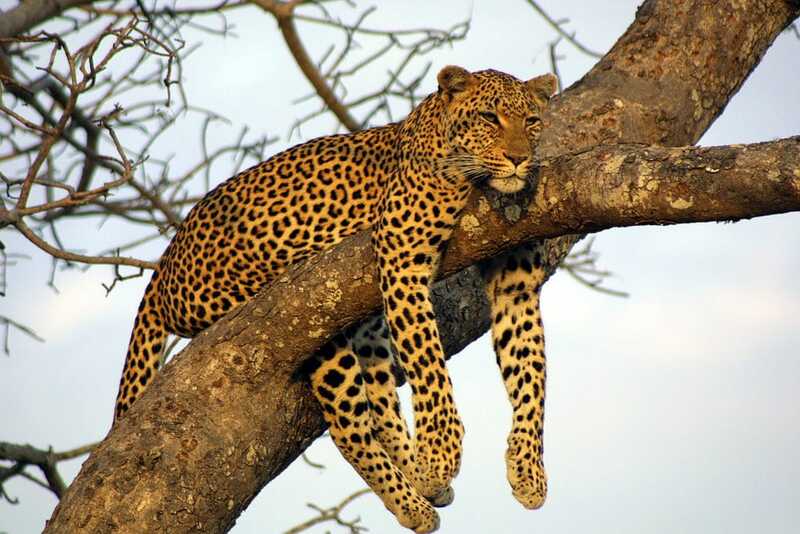 Check out our Participation Safaris for some great options! These are fully-serviced camping safaris and are perfect for those looking for a little more comfort than a budget safari. 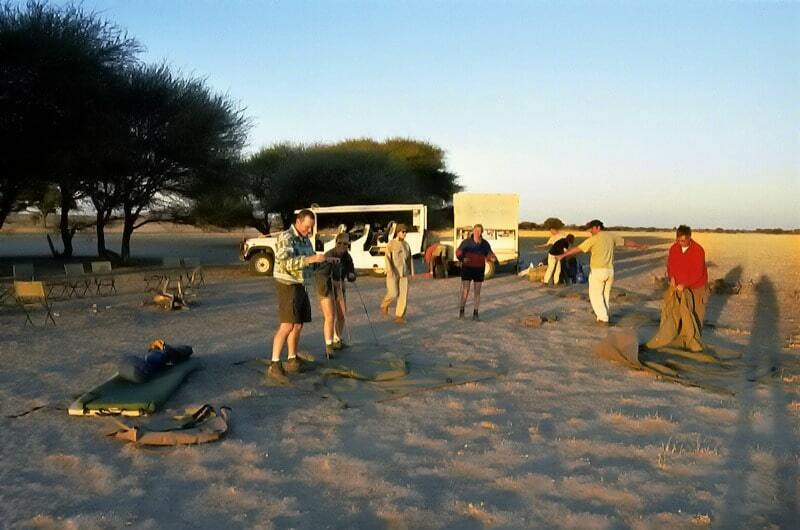 Each safari is accompanied by a team that does all the camp chores (cooking, setting up camp, etc). The itinerary visits the all the famous game parks in Botswana. Pros: As a fully-serviced safari all chores are done for you so no participation required. Groups are small and you’ll travel in specially designed 4x4 safari vehicles. All meals and drinks are included. You’ll sleep on cots and each dome tent has a private toilet and shower. Depending on the itinerary, a mokoro or boat excursion is also included. Most campsites are in the remote bush and there’s always the chance wildlife will wander through camp. Cons: These safaris are more expensive than a budget safari. There may be some long days of driving between certain parks, depending on the itinerary. As these are schedule departures we can’t amend or change the itinerary. Take a look at our Best of Botswana Safari for an example of a mid-range safari. 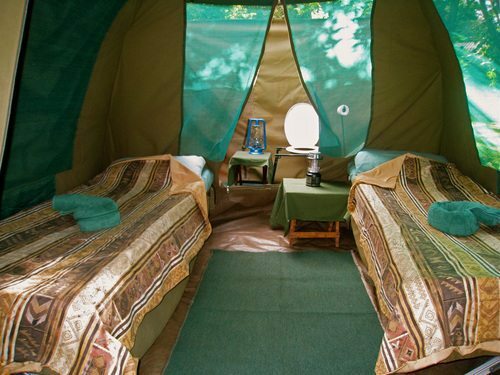 Also a fully-serviced safari, a luxury camping safari offers more amenities than a mid-range camping safari. Each safari is accompanied by a team that does all the camp chores and, depending on the group size, you may have a larger camp staff to attend to guests’ every need. Pros: As a fully-serviced safari all chores are done for you so no participation required. Groups are small and you’ll travel in specially designed 4x4 safari vehicles. All meals and drinks are included. 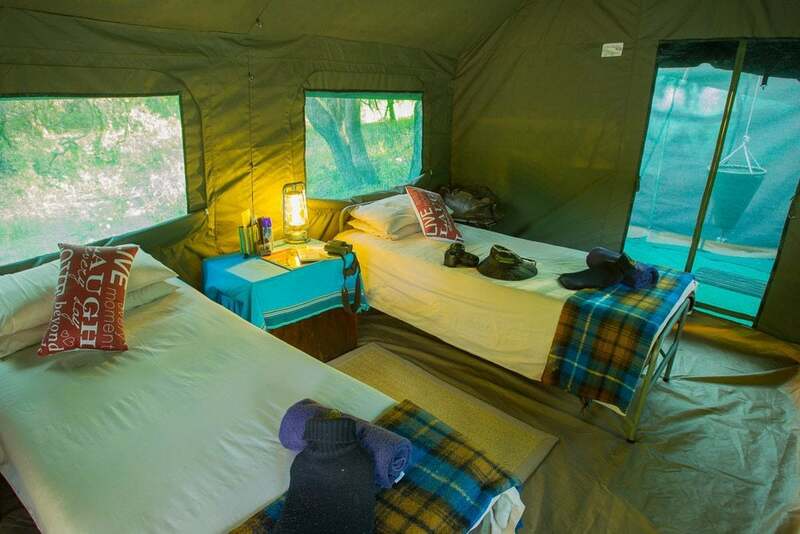 Tents are large, walk-in, Meru style with beds and attached private toilet and shower. Mokoro and boat trips are included and possibly the opportunity to join your guide on a bush walk. Some itineraries include a flight into the first camp. Most campsites are in the remote bush and there’s always the chance wildlife will wander through camp. Cons: The main drawback to a luxury safari is the price as they are significantly more expensive than a mid-range camping safari. As these are schedule departures we can’t amend or change the itinerary. See our Great North Road or Miracle Rivers itineraries for examples of a luxury camping safari. If you don't want anything to do with camping, then a lodge safari may your type of accommodation. There’s a huge variety of lodges across Africa but a lodge stay will provide all the comforts and amenities. Some are exclusive, tented lodges in remote areas while others are more accessible but with more rooms. Costs range widely but we can help find a lodge that fits your style and budget. Lodge safaris are perfect for the first-time traveler or someone that wants to experience Africa in comfort. Pros: Lots of comfort! Think big beds and hot water. Most have excellent service, friendly staff, and your stay is fully inclusive of all meals/drinks. Activities vary (and are inclusive) but can include game drives, night drives, bush walks, boating, and community visits. We can easily customize a lodge itinerary by mixing different lodges located in different environments or combining lodges with a camping safari. Cons: Though some lodges are in the remote bush they may not actually be in a national park. Depending on the size/location of a lodge there may not be much wildlife wandering around. Some lodges are relatively large so there may be more people around. Lodges may not be accessible by road so you may have to fly from lodge to lodge. See our Zimbabwe Lodge Safari for an example of a lodge safari. These are just a sampling of some of the African Safari adventures that we offer at GrassTrack Safaris. 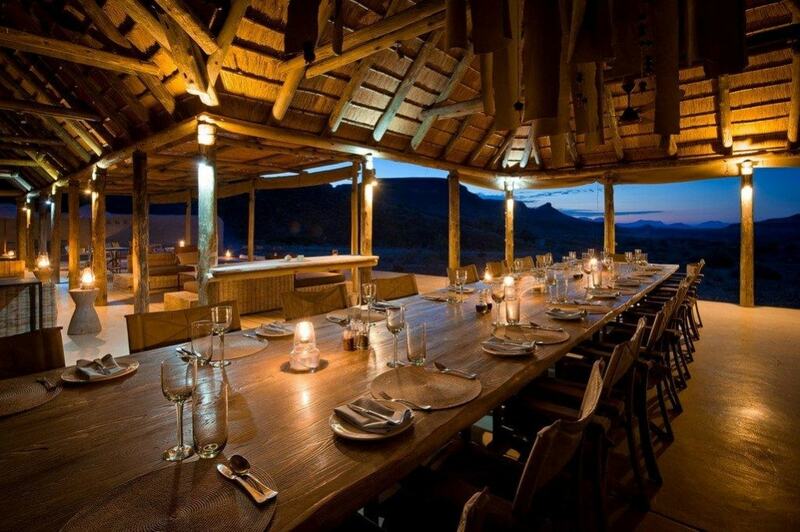 We can tailor any package to your needs to help you build your perfect safari experience! Nicely written. The pros/cons listed are very helpful. Are there any pros/cons to going during different times of the year? For southern Africa, roughly June-Oct is the dry season, with cool, comfortable temps. This time of year the grass is low and many waterholes have dried forcing animals to congregate at permanent water, so the game viewing is excellent. However, it is also the high tourist season so prices reflect this. The rainy season, from about Nov-May, has different advantages. Many animals give birth, the landscape is lush and green, and birds are in their breeding plumage. Game is still good but animals are more dispersed, there’s always the chance for rain showers, and it is generally hotter. Hope this helps!